3 1/2 x 2 7/8 in. / 8.89 x 7.37 cm. 11 7/8 x 15 in. / 30 x 38 cm. 20 5/8 x 15 7/8 in. / 52.4 x 40.3 cm. 13 x 15 in. / 33 x 38 cm. 11 3/4 x 15 in. / 30 x 38 cm. 13 7/16 x 11 in. / 34.1 x 27.9 cm. Elin Rødseth fills her world with strangers: the vaguely familiar people we pass on a busy street or in a crowded room. These encounters are both intimate and withdrawn, as the faceless drifters give us no indication of their thoughts, feelings or histories. That emotional void is at the heart of Rødseth’s "Passersby" Series, a collection of ghostly impressions that hint at fading memories, disconnection and the distance of time in personal space. Small in format, they are reminiscent of old, discarded family photos. 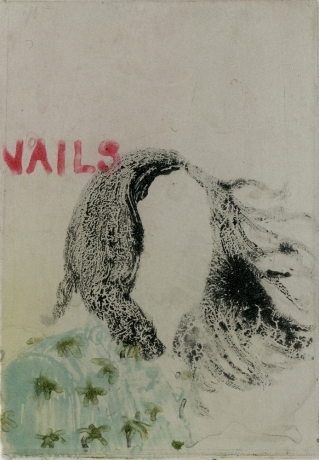 Through the photopolymer printing process, each Passerby has an ephemeral quality made through slight gestural strokes. They only provide us with an idea of a person, as most defining details have been left out: faces, backgrounds, hands, the things with which we discern individual identity. By applying this soft touch, Rødseth lends each work the washed-out tonality of watercolor. As a printer, she does not follow the more rigid process of creating identical reproductions. The artist is open to improvisation and exploration in printmaking, and so her color palettes will often vary within a single edition. Likewise, she often works in monotype series, moving and interchanging figures and features like props on a stage. This can be seen in the "Neighbor" Series, and in works such as "Men." The fact that the figures can change or move helps Rødseth to keep them depersonalized and alien, and in a sense, insignificant. This is what draws her to print. She has said: “With printmaking as a medium I get an appreciated distance to my motives. Some of the information disappears in the process. 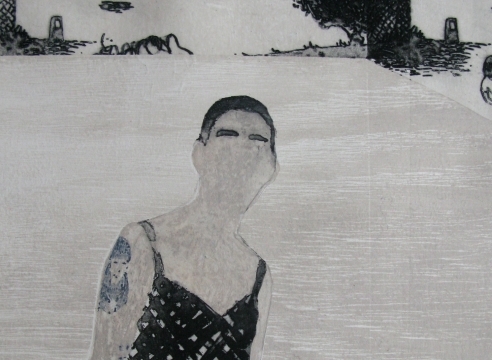 What appears on the paper is a peeled, distant and mirrored version of the original.” In addition to photopolymer, the artist also works in woodcut, and often combines the two processes in various ways, such as in the "Bystander" Series. Composed with the muted tones of grey and blue and brown, these works bring to mind the winter landscape of Rødseth’s native Norway. The artist will be in attendance for the opening.